Connecting smart cards and mobile phones enables cities to offer more efficient mobility and a safer, quality experience for all transport users. Photo by EMBARQ Brasil/Flickr. Emerging technologies, together with big data, are tools that allow us to better plan our cities and revolutionize the efficiency and quality of our transport systems. We are seeing threads of this already, as millions of people use smart cards to board the bus or metro and carrying smart-phones that provide route guidance in cities like Bogotá, New York City, or Kuala Lumpur. Yet, these two technologies are not effectively linked. Although transport globally is faster and more automated than ever, accessibility and quality of service remain key issues. Connectivity between these emerging technologies can unlock the potential for big data to expand access and improve the quality of transport systems in cities around the globe. 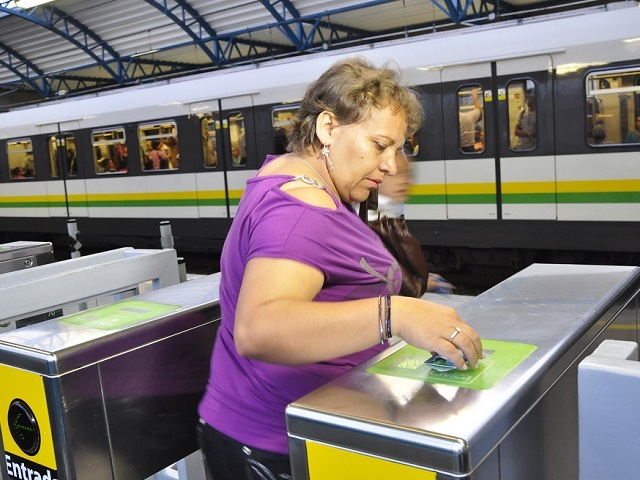 Smart cards, which have magnetic strips that allow users to load money onto them like a debit card, make boarding and paying for bus and rail services more efficient. Although it might only save each individual a few minutes over the course of the day, over the course of a year this adds up to hours, and for the entire system the efficiency gains are immense. For planners, when users swipe their smart cards, it allows them to see in real time peaks in demand. This means planners do not need to expend as many resources collecting outdated or inaccurate data and can spend more time adjusting routes to meet the needs of everyday transport users. At the same time, the rise and proliferation smart phones is allowing allows for nearly ubiquitous Internet connection. This trend seems poised to continue, with emerging 5G networks likely to operate 80 times faster than existing 4G networks. This means that phones will be able to process increasing amounts of data in real time. More real time data means more informed decisions and a wider variety of transport options for urban residents, improving mobility and access in the city. For example, the Waze application, a community-based mapping app with platform similar to Google Maps, uses crowd-sourced data to notify users of traffic crashes and other obstacles, and helps them find alternate routes. Even this small contribution helps the entire system become more efficient. Until recently, however, smart card and mobile technologies have not been effectively integrated. Taking cues from they way an app like Waze uses both GPS capabilities built into phones as well as data from surrounding Waze users, transport systems can also become more intelligent. For example, knowledge of their typical users’ mobility patterns – that they use metro three days out of the week, walks one day, and use a combination of bus and bike the other three, for instance – allows transport planners and operators to tailor routes and times to meet users’ needs and increase system efficiency. The integration of big data with mobile technologies is essentially unlimited. Each transport system can potentially relate to each user individually, offering them the best transport mode based on what events they have on their calendar, the congestion on roadways, weather, their weight loss goals, and other individual considerations. The more users, cities, and application developers that join this system, the more it can provide. Although this system may sound like science fiction, it actually already exists. JMP Consultants created a small microcosm of this model for York, England. Within this city, citizens have virtual profiles and their mobile phones guide them through every stage of the transport system. It should be noted that there are several possibilities for abuse of these technologies, both by governments and private citizens. Users must be able to opt of out of such a connected system for their own privacy, and all safeguards must be taken to protect individuals’ data. Yet, the possible gains in efficiency, sustainability, and quality of life for everyone in the system outweigh these possible abuses. With connected systems, cities will be able to increase the quality of their transport systems, avoiding major new construction and the financing barriers that come with them. This opens up significant opportunities to create safer, faster, more enjoyable transport systems for all cities, and moves one step closer to access to sustainable transport for all.